So I have been playing around with my new Hero7 Black, and I cant seem to edit at all in Davinci Resolve, it just doesnt show a preview for the video, when i import it there is no playback.. occasionally it shows a playback, but then I get error 77.
anyone else using Davinci that could help ? A lot of people have being having this issue with the latest version of DaVinci Resolve. Here's some things you can try. Adjust the frame rate of your render. Try generating optimized media and then selecting optimized media when you render. Select all the clips in the timeline, right click, select generate optimized media, let that render. Then select use optimized media when you render which is on the video tab on the delivery page. I hope that helps! Also check preferences for any GPU settings that Resolve may have regarding your card. Make sure you turn Force Debayer to highest quality. If you're worried about quality loss when using optimized media, you can increase the bit rate to make up for any loss in quality. You'll have to use H.264 in camera as much as you can. Where HEVC is the only in camera option, you'll have to convert the footage to H.264 using something like Handbrake after the fact. Being the nerd I am, I dug into things and found the easy solution. I made a video on YouTube that describes the issue with H.265 vs H.264 and how to fix it. You can record in HEVC and easily edit in Resolve 15. You just need the HEVC codec for Windows. Also, an Intel 7th gen processer or newer (older ones may work but might be slowwwww). For reference, I have a 7700K with an NVidia GTX 1080 gpu.... I generally can render 10 FPS. It pegs my CPU at 98% and my GPU is only about 10% utilized... it's a BIG bottleneck on the CPU since it has to decode and reencode. Link to the codec (FREE from Microsoft for Win10 FTW) is in the video's description. Hope it helps you guys out! 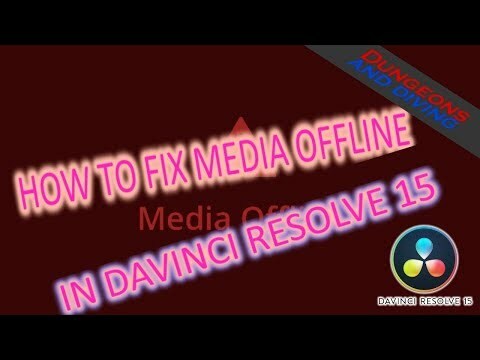 🎬 How to fix DaVinci Resolve Media Offline with GoPro Hero7 Black Video!! !